They flip through the air, dance precisely to choreographed routines, and, each year, try to top the pyramid formations they’ve done in the past – all in an effort to raise enthusiasm and school spirit for Fox Chapel Area’s teams and fans. During the past few years, however, the Foxes’ cheer teams also have taken their routines and lively performances on the road, but that wasn’t always the case. It’s something that Coach Aleta Balcer has incorporated into the program since she took over four years ago, and her efforts are taking the squad to new heights and getting them noticed. For the first time in school history, the team participated in the WPIAL Spirit Championships held in January at Hempfield High School. The event drew 33 high schools, and while the girls didn’t advance to the state level this time, they did learn plenty by watching those who did. Coach Balcer says the experience revealed that to compete successfully, more physically demanding aspects need to be incorporated, including additional gymnastics and advanced stunting. “Those will be things we’ll be working on before the start of football in the fall,” she says. Even before the WPIAL competition, Coach Balcer had encouraged the team to participate in the high school strength and conditioning program supervised by certified coaches. “I strongly promote the idea that cheerleaders are athletes and should participate in strength and conditioning exercises, just as is done in all other sports,” says Shannon, who doubles as a lacrosse player for the school once the cheer season is over. 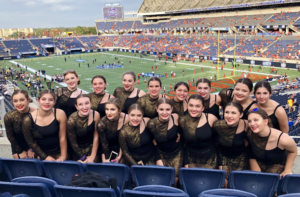 Also, over winter break on December 28, 2018, the cheer team took a part-performance, part-fun trip to Orlando, Florida, to perform at halftime at the Camping World Bowl game. It was their second invitation to perform at the annual college football game. Prior to the flurry of activity at the very end of 2018, the team also had competed for the fourth time at the Battle in the ‘Burgh cheer competition held at the Petersen Event Center on the University of Pittsburgh campus. They successfully showcased their talent by winning their division for the third time. Last year, the girls finished second. While Coach Balcer is proud of how her teams have progressed, she’s equally as happy with how they are giving back to the community. For the past four years, the squads have held a benefit toy drive and donated the proceeds to various local charities each year. This year, the toys went to the The Children’s Home of Pittsburgh. They’ve also marched in the Aspinwall Memorial Day Parade, had a presence at the community’s National Night Out, and cheered on participants taking part in local charity races. Even so, there is still a lot more that Coach Balcer has on her bucket list.